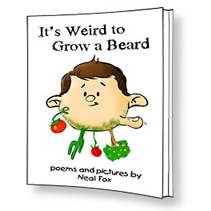 It’s 17 poems and 39 illustrations. Took a few months but I think it turned out great. It was a necessary break from all the research I’ve been doing on CONSPIRACY. This book is pure fun. I think it’ll be good for kids from three to ten years of age. Now all I have left to do is get it formatted for the various eBook formats. Also need to format it for the physical book. Each one is a slightly different thing. Not easy. And I’m creating a new web site that’s more “kid friendly” then this one. That one is Neal-Fox.com (with a dash). Also created a trailer for the book. So this should take me clear into the beginning of 2013. Then on to CONSPIRACY!